Since his debut in Carlo Collodi’s 19th century children’s book, Pinocchio – the wooden puppet who can walk, talk and get into trouble – has appeared in countless adaptations, from fine art and theater to radio, cinema and television. Always, the lesson is the same: Tell the truth, and you will find your way. John Davies’ take on Pinocchio, while it’s not the first opera devoted to the innocent, nobby-kneed kid whose nose grows when he tells a lie, is certainly unique in that it’s written expressly for children. Now onstage at Opera Central, headquarters of the St. Petersburg Opera Company, the one-hour Pinocchio not only deftly delivers the time-tested message – truth is good – it also provides young people with an amusing, entertaining introduction to a form of storytelling they most likely haven’t run across before. Appropriately, it’s fast-paced and it’s funny for those notoriously short attention spans. Here are Pinocchio, Geppetto and a sextet of characters both new and familiar, combining dialogue – sharp, to the point and easily-digestible – and furthering the story along with songs. Wolf and Cat, two disreputable figures, conspire to kidnap the wooden boy and deliver him to the no-good puppet master Dr. Dulcamara. 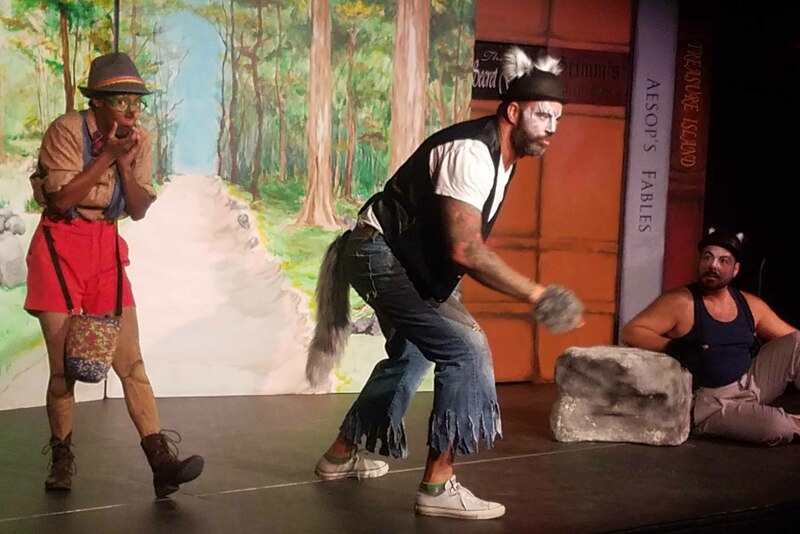 Wolf (bass Andrew Emery) and Cat (tenor Chris Romero) are played strictly for laughs, however – they recoil in terror when Pinocchio threatens to “tell their moms” – and their big duet is sung to a winsome melody from Mozart’s Die Entfuehrung Aus Dem Serail. It can be done with a teeny-weeny lie! New to this version of the tale is the mechanical doll Olympia, imported by the author from Offenbach. Although she requires winding-up before she’ll sing and dance, Olympia becomes Pinocchio’s friend and ally. Portrayed by soprano Kathleen Farrar Buccleaugh, Olympia trills “In the spring, the little birdies” (also from Offenbach) and duets with Pinocchio on a vocally-graceful section of Pergolesi’s La serva padrona. At the preview performance I attended, the schoolchildren could not get enough of it. They laughed, they gasped, they sat in rapt attention. At times, they sang along. As the title character, mezzo-soprano Taylor-Alexis DuPont projects an air of guilelessness that perfectly captures the look – and sound – of an innocent who literally does not know which way to turn. “Pa, Pa, Pa,” from Mozart’s The Magic Flute, is performed as a tender duet with Geppetto (tenor Chandler Johnson), while the other characters combine forces for selections from Don Pasquale, Don Giovanni, The Marriage of Figaro, La Cenerentola and others. We’ll try every day our best to be true! Although seasoned opera-goers will recognize Die Entführung aus dem Serail. Unlike adult opera, where love, loyalty and betrayal can (and usually do) lead to some sinister things, in Pinocchio – a sweet and entirely winning children’s introduction to opera – the message is simple and direct, delivered as pretty, primary colors.